Head to Toulouse Street in the French Quarter at your selected time for your 2-hour Sunday brunch cruise. 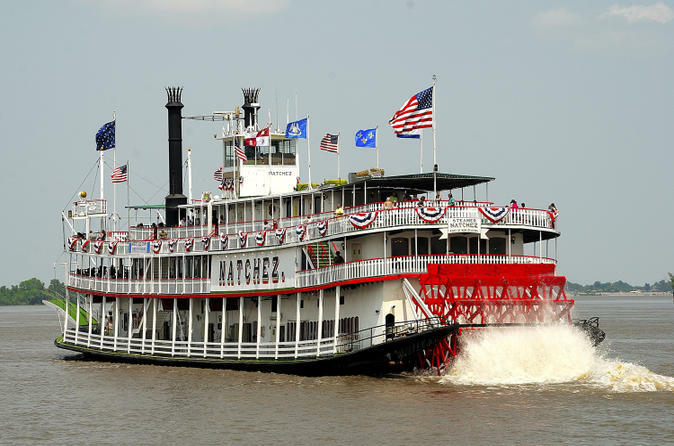 Board the Steamboat NATCHEZ, an authentic paddle-wheel steamboat that will take you on an old-time ride along the Mississippi River. This steam-powered vessel has everything from a museum-quality engine room to a megaphone to call the ship's orders. As you steam ahead on the Mississippi River, enjoy marvelous views of New Orleans’ skyline while being treated to live music performed by a jazz trio. There is also live narration on board. Inside the cabin or on the outside decks, sit down to a delectable Louisiana-style buffet brunch. Savor dishes such as egg frittatas, Creole shrimp, cheese grist, bread pudding and fresh fruit (see full menu below), all tasty Louisiana favorites! Drinks including mimosas, punch and Bloody Marys are available for purchase. Your brunch cruise ends back at the French Quarter with plenty of time to continue your New Orleans sightseeing on land.